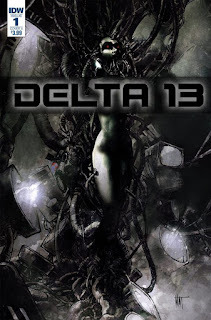 The Fellowship was fortunate enough to obtain a copy of DELTA 13 #1 from IDW Publishing. Steve Niles writes, Nat Jones draws and colors, and Tom B. Long letters. A small survey ship is dropping probes on asteroids in the belt. They’re a small but experienced crew, and as professionals they get along well enough. After one more uneventful drop, they move on toward the next rock. But this time there’s an uncharted rock in the way, and it’s huge. And that’s not the only thing that’s strange about it. This crew has a really big, really weird mystery on its hands. This first issue does a very nice job of showing us how normal these folks are, and it does some powerful hinting at how not normal their situation is about to become. It’s a wonderful setup for the story, and the art gives us some beautiful visuals of the vast asteroid and just how alone they are out there. Focusing on the crew is a great way to start this story off right. We may not know where it’s going, but we do know who it’s going to happen to. And that’s how you build tension, and now I can’t wait for the next issue. Go get this one. DELTA 13 #1 is available now from your local comic shop, or online at idwpublishing.com.